Sitting in the sun, with my Vegan Doc Marten satchel- PETA membership card on display in the card-slot- I really feel I have found somewhere I belong. BBVegan can make you feel that way. This friendly, relaxed place is entirely vegan and offers a varied, flavoursome menu full of interesting and exciting plant-based meals. 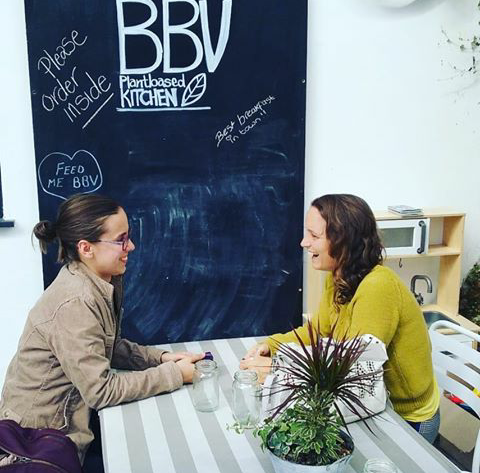 Open since January 2018, the BBVegan restaurant offers indoor and outdoor seating which is dry, cosy and clean. There are small intimate tables (some are pink!) and large ones perfect for groups. Drapers Yard is a gorgeous setting and the whole place has a fantastic atmosphere. 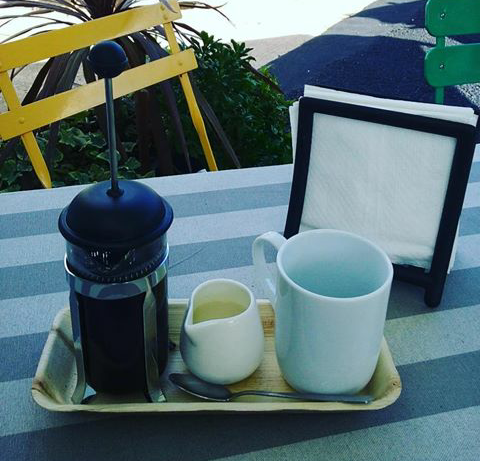 The coffee is served in a French Press on a bamboo tray – and I loved not having to ask for 'alternative' milk. Here, I am not the unusual, the awkward- I'm a customer for a wonderful Vegan business. 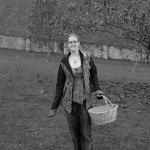 The menu is full and varied, depending on what you fancy there is something for everyone. Owner and chef, Shiara has created a truly unique and delicious plant-based menu that satisfies both body and soul! She recommended her Balti Curry and I'm so glad she did, the mixture of flavours was amazing. Served in a massive bamboo bowl, it won't leave you hungry. It is served with rice and a parathas (flakey naan thing- absolutely delicious!) Shiara has always been a Vegan chef and became fully vegan nearly 2 years ago. I have since tried a variety of foods and have never been disappointed, the menu changes with the seasons and Shiara is constantly coming up with new ideas like the new Rainbow Parantha which contains lentil, purple cabbage, fruity chutney, cheeze and avocado! 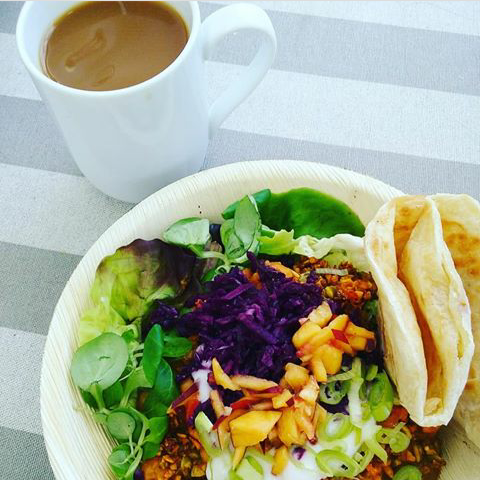 Shiara explains, "My reason for opening BBV is to create and supply delicious vegan food that appeals to everyone and busts open the preconceived idea about what vegan food is. I challenge people to rethink vegan food and hopefully get more and more people eating plant-based food more regularly, in so doing minimise the impact on the environment and the suffering of animals." There are lights above my head and I imagine when the sun goes down the atmosphere is enhanced, you don't have to wonder as BBVegan has a plan for cosy Winter evenings- follow their Facebook and Instagram to stay up to speed on what they have planned. For dessert I had a wonderful coconut cream cake- it was probably the best thing I've ever eaten, I loved it so much. The base is made up of dates, nuts and pure maple syrup, I would highly recommend this sweet and will be purchasing again! Shiara says, "Once you try it you will love it! We offer demos, free classes for under the 20's!" They have a fridge full of beautiful raw desserts to choose from, you really are spoilt for choice. I have since returned and tried the Wild Blueberry Cheesecake which was sublime. Owner, Shiara and team have recently started serving breakfast too, in addition to a great selection of lunchtime options. Shaira says, "You can pre-order food for the week too and we have pre-made meals in our fridge that are ready to go!" 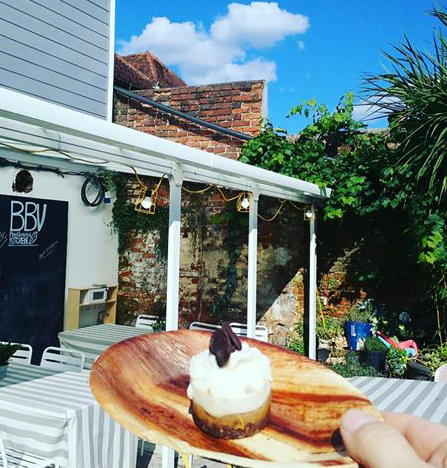 My experience of BB Vegan found an excellent selection, friendly and welcoming staff and Gorgeous venue, a great place for friend group and couples to enjoy together in a relaxed, welcoming atmosphere. Visit them for a yummy meal or to have a chat about any catering needs. Great for: Friends, couples, lone dining- big groups can be accommodated too. Amazing article Sara, shall definitely visit your cafe, once in town. I am also recommending my parents to visit your cafe’ soon. I am also running a small car rental business worldwide Do check us out too. What's Happening at VegFestUK Brighton 2018?